Take Control of Your Links! Z.ips.ME is a free open-source program that allows you to use your website as your very own URL shortening service! Create shorter and easier to read links, which are especially useful in print marketing and on Instagram where you cannot hyperlink. You control how long your links stay in place. Keep them up forever if you want, or redirect them somewhere else. You brand your domain instead of bit.ly or tinyurl.com. Name your own links with relevant keywords. For example, z.ips.me/Idea links to a blog post about the origins of Z.ips.ME. In depth stats allow you to see what links are clicked most often, when they were clicked, what referring sites users came from, what browsers they're using, and more. You control whether a link is a 301 redirect (permanent, search engine friendly) or a 302 redirect (temporary). Responsive design makes it easy to use on your desktop, tablet, or phone. After a successful install you'll be able to log in on the admin page. 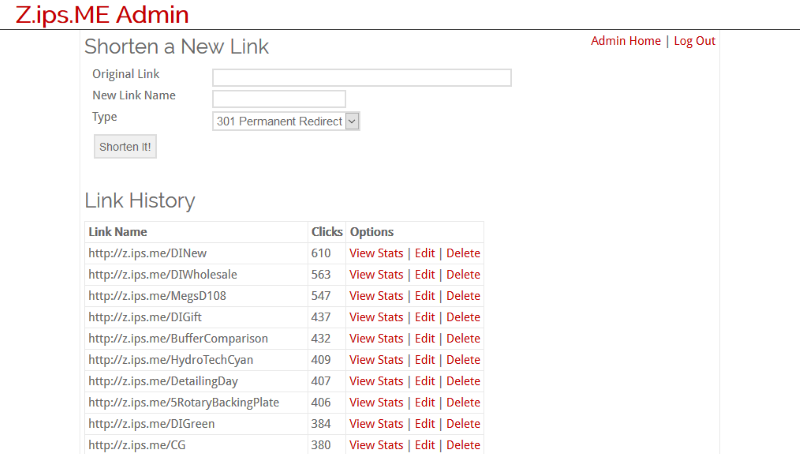 Once you log in, you'll be directed to the Admin Home where you can shorten a new link or modify an existing link. Your browser will save your login information in a cookie for up to 1 year. Bookmark this page to make shortening a link just one click away. You can view real-time stats for each link. 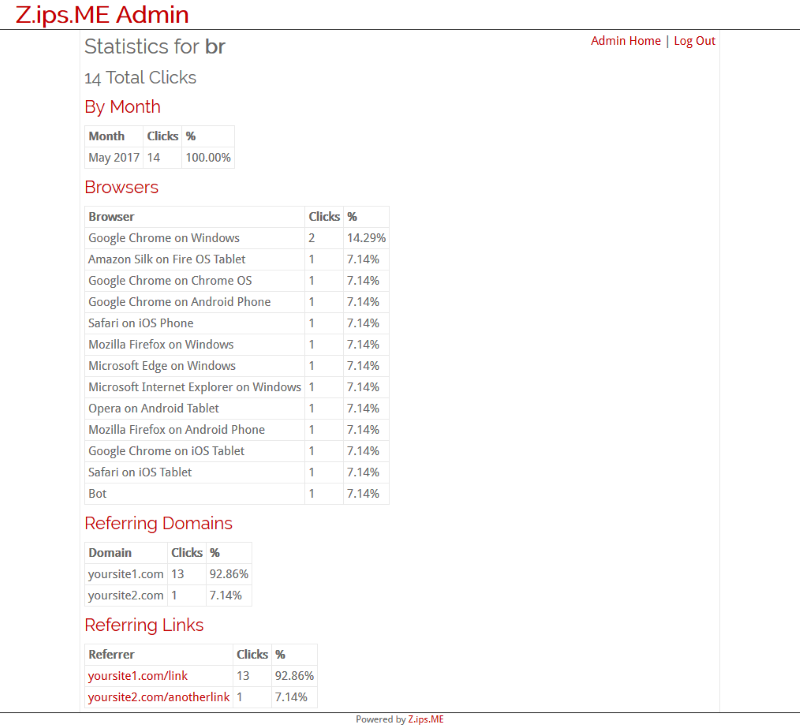 You can view the number of clicks, clicks by month, web browsers used, referring domains, and referring links. Z.ips.ME was developed for PHP 5.6+ / MySQL 5.6+, however it may work on earlier versions. You can also download older versions of Z.ips.ME below to use on older software. Installing Z.ips.ME is relatively simple and straight forward, especially if you've installed WordPress. Create a MySQL database and MySQL database user on your web server. Make sure the user has permission to SELECT, INSERT, UPDATE, DELETE, CREATE, INDEX, and ALTER. Make note of the database name, the database user name, and the password. Open the config.php file in a text editor. Edit the database information, site information, and admin username/password as instructed in the file. Upload the entire contents of this folder to the directory on your site that you plan on using as your URL shortener. Run the install.php file in your browser. If your URL shortener is http://www.yoursite.com/zipsme/, the file will be located at http://www.yoursite.com/zipsme/install.php. After the install script has created the database, it will display a link to the admin section (located at http://www.yoursite.com/admin.php). You can now log in with the username/password combination that you entered into the config.php file. View the readme.txt file for more information on installing or upgrading from a previous version. The .htaccess file isn't uploaded to your server. This file is required for creating your links. If your host doesn't give you permission to upload and modify your .htaccess file, you will not be able to install Z.ips.ME. Your database connection isn't correct. Verify that you have filled out the config.php file correctly. For other issues, try changing the IS_ENV_PRODUCTION variable to false in your config.php file. This will output error messages, which should help narrow down the problem. If you're still unable to resolve the issue, you can email me and I'll do my best to help. Z.ips.ME is released under the GNU Public License, the same license as WordPress. My name is Adam McFarland. I'm the co-founder of Pure Adapt Inc, an e-commerce company located in Albany, NY. I originally created Z.ips.ME for internal use within our company.